Victoria (1837-1901), gold Half-Sovereign, 1884, fifth young head left, date below, legend surrounding, rev crowned quartered shield of arms, legend surrounding (Marsh 458; M.C.E. 602; S.3861). Toned extremely fine. 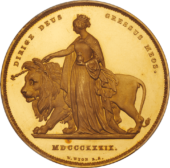 Victoria (1837-1901), gold Half-Sovereign, 1884, fifth young head left, date below, legend surrounding, rev crowned quartered shield of arms, legend surrounding (Marsh 458; M.C.E. 602; S.3861).